Ron Stanley was looking for some steel tab for George Strait's "You're Something Special To Me". Paul Franklin plays steel on the studio recording although Mike Daily plays it live. Here's a shot at Paul Franklin's steel break which starts just before 2:00 on the original recording. Tab is in C6 - I've got a D string on top. Corrections and slicker ways to play things are always welcome. Thanks for posting, Kyle. P7 opens up a whole new world of cool moves and seems to make more sense for the sound and phrasing Ron Funk just messaged me last nite with a similar recommendation. I think he'll also be posting a full C6 chord chart shortly. 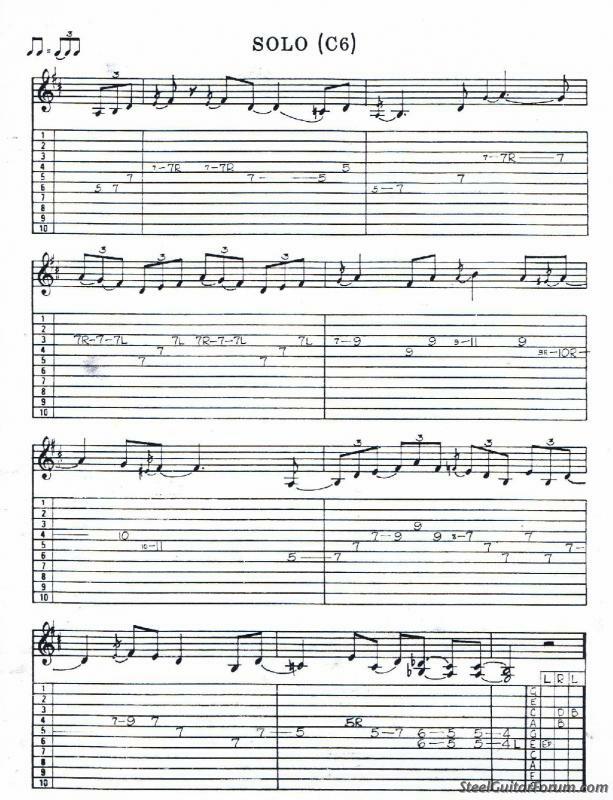 Here's copy of song's chord progression - and also the steel's instrumental solo - as tabbed out by great player & friend to all......Russ Wever. 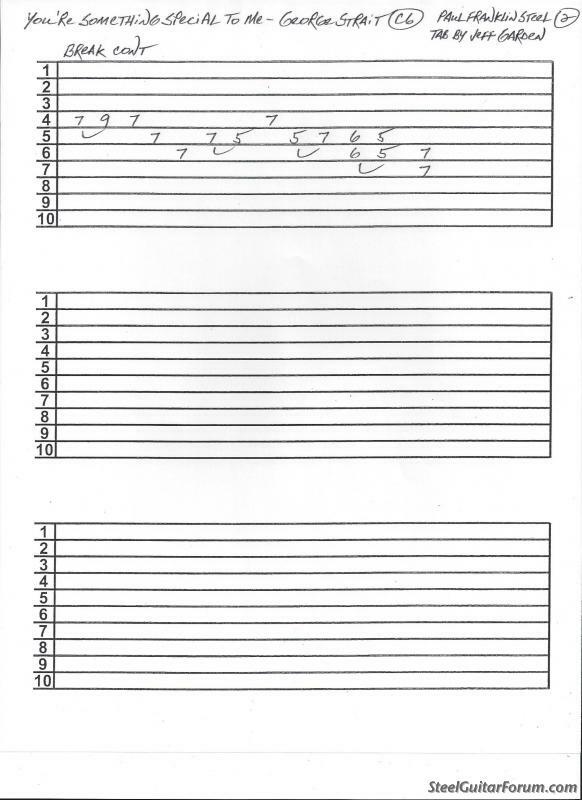 The chord progression Russ tabbed out for the song reveals where chords / chord inversions are found on C6th neck. Beneficial exercise by itself. Using P7 to obtain the raises on strings 3 and 4 is integral part of PF's solo. 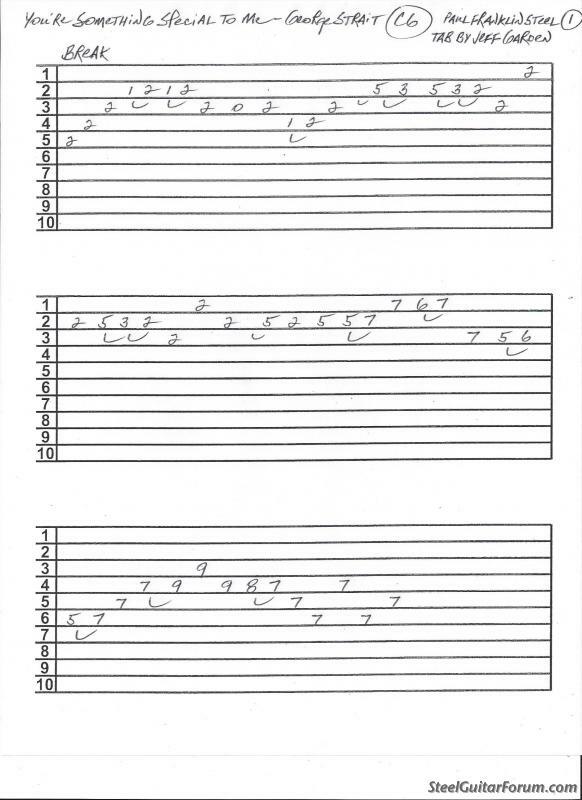 The single note run of 3rd string raised (via P7), then slurred open, then lowered via knee lever in full measures 3 and 4 goes by pretty quickly and will require some practice to master. A great riff to add to one's tool box. This song has to be one of the very few in last 20 years or so that became a radio hit with a C6th steel solo. Thanks to Russ Wever for tab. You do a great job on all your tabs. We all appreciate your work. As we know, proper notes can be found in a number of places on fretboard. 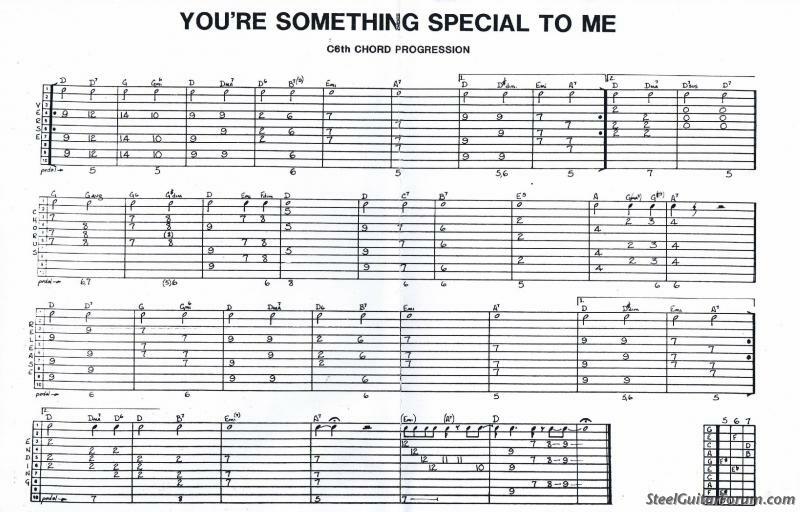 Use of P7 in '5 frets up from Open position' yields proper voicing for this song. Way back when I was Russ's student at Scotty's Music, we'd compare tabs for whatever was current on country radio. He won most - if not all - of the time! Russ Wever is due all the credit on this one. Old thread, I know, but I just thought I'd post an updated link to the song since the original link posted is no longer working. i'm glad this thread came back around...it's gold for where i'm at for c6! Jeff Newman had it tabbed in E9th. Charley, please post that if you have access to it. If you’ll click on my link above, I tabbed it in E9 also, but that was 11 years ago and I remember it being a little wacky to play at the time. I’d love to learn Jeff’s version!